The Democratic Alliance has pointed out an irregularity in President Jacob Zuma’s decision-making process prior to reinforcing South African troops in the Central African Republic – a decision that cost 13 South African lives. By KHADIJA PATEL. 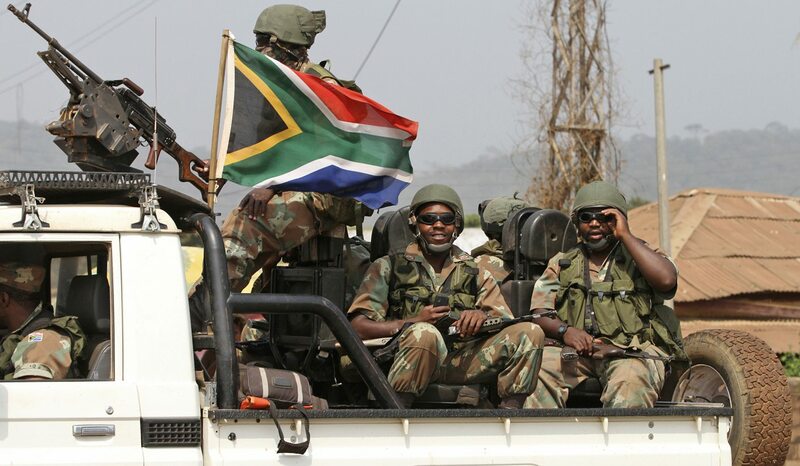 It’s been weeks since the withdrawal of South African troops from the Central African Republic, but the debacle continues to raise uncomfortable questions – the most recent coming from the Democratic Alliance, which has pointed out a significant irregularity in the process. President Zuma and Minister of Defence Nosiviwe Mapisa-Nqakula have argued that the decision to send 200 South African soldiers to Bangui in January this year, in the midst of a rebel insurgency, was based solely on a previously existing Memorandum of Understanding (MoU) between the two countries. Yet on Wednesday evening, the DA revealed that the decision to deploy the troops in December last year was made through a series of diplomatic notes, and not on the basis of an extension of the MoU. “There was only an ‘Exchange of Diplomatic Notes’, between South Africa and the CAR, signed on 31 December 2012, recording certain ‘understandings’ aimed at ensuring South Africa played a more meaningful role in the CAR,” Shadow Minister of Defence David Maynier said in a statement. Maynier had received the correspondence, which includes the text of the actual renewal of the MoU (dated 11 February 2013), from minister Mapisa-Nqakula on Wednesday. He told Daily Maverick that the documents he had received required further scrutiny and analysis from experts. An initial study of the document has, however, convinced him of a discrepancy between the minister’s version of events and the paper trail available. “The diplomatic notes appear to amount to a new agreement, which differs substantially from the original MoU signed between South Africa and the CAR in 2007,” Maynier explains. “An agreement between the Government of the Central African Republic and the Government of the Republic of South Africa concerning Defence cooperation signed in Pretoria on 11 February 2007 has been extended for another five years. “The Agreement promotes co-operation between the Parties on peace and stability and the training and capacity building of military personnel through the exchange of trainees, instructors and observers. In terms of the original MOU signed in 2007, an exchange of diplomatic notes can suffice to extend the MOU between South Africa and CAR. “The MOU shall remain in force for a period of five years, which may be extended for further periods of five years by means of an exchange of notes between the parties through the diplomatic channel,” the text states. The exchange of diplomatic notes in the place of a new MOU is then not contentious. What is however significant is that Mapisa-Nqakula signed the diplomatic note detailing the agreement of the extension of the MoU on 31 December 2012 – ten months after the original MoU had expired. “This MoU shall enter into force on the date of signature thereof,” the text states. The original MoU was signed by then-Minister of Defence, Mosiuoa Lekota on 11 February 2007. It expired on 11 February 2012. For ten months then the MoU was in limbo. And yet, South African military trainers were still in CAR even in the absence of a valid MoU. The new agreement detailed in the diplomatic note now comes under scrutiny. Spokesperson for President Zuma, Mac Maharaj, referred enquiries on the matter to the department of defence and military veterans, whose spokespeople were in turn were not available for comment. It remains for Minister Mapisa-Nqakula and President Zuma to explain how the diplomatic note figures in the extension of the MoU and the deployment of the South African troops, who would come under rebel fire three months later. What remains to be answered, however, is how the timing of the amendment to the MoU – which allowed for the deployment – matches up with what actually took place. When Mapisa-Nqakula briefed the National Assembly’s joint standing committee on defence on the deployment of SA troops in CAR earlier this month, she said CAR was pushing for the renewal of the MoU since last July – when she took over the ministry. However, she said at the time she was unsure because reports showed that the number of soldiers being trained by the SANDF had been in decline over the years, while there was no certainty about where those trained were landing up. But she said after a long period of negotiations, the SA government had made a decision to renew the agreement. “This was partly because there was a view among government officials in that country (CAR) that amongst others, our task was to protect the leadership of the country,” she said. The decision to amend the MoU to allow for SA troops to be deployed, however, must have been a hasty one. The former president of CAR, Francois Bozize, told the French magazine Jeune Afrique shortly before he was ousted that President Zuma reacted quickly to his request for assistance. Maynier, however, calls foul on the South African president’s hasty decision. “This clearly shows that President Jacob Zuma misled Parliament on the deployment of the South African National Defence Force (SANDF) in the CAR,” he said. He told Daily Maverick that the irregularity in the procedure pointed to a failure in the leadership of the president.